White_A8_Envelopes_-_5_12_x_8_18 is rated 3.0 out of 5 by 2. Rated 5 out of 5 by envelopes from great service! I bought some odd sized envelopes, and made a mistake on the delivery address. The company immediately sent out another order at no extra charge. I was so pleased with the service, the quality and the selection. I highly recommend this company! Can you send me one sample please. Thank you. Please select which color you would like a sample of and click &quot;Request Paper Sample for Color&quot;. This will add the sample to your cart. I received my order yesterday. The envelopes that I received are Ivory, not White Parchment. Hello, We are sorry for the inconvenience with your order. Please call our customer service number and speak to a representative directly so they can best assist you live via phone. You can reach our customer service representatives at 1 - 800 - 8010 - JAM Monday through Friday from 9AM-6PM. Thanks! What is the flap size on an A8 envelope?? 2 1/2 inches. Hope this helps!! Are these machine insertable? What size is the flap? Take your pick out of this lovely A8 selection. 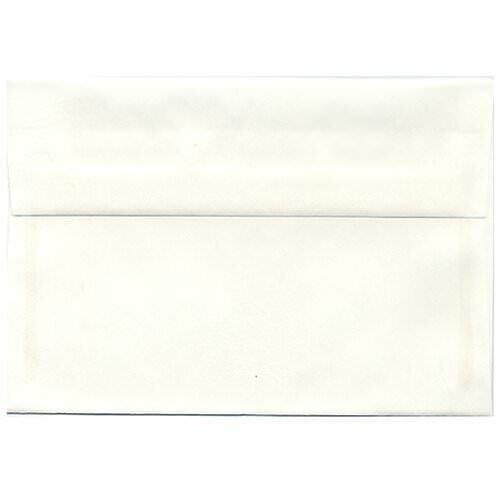 Lack of color does not imply lack of style; all you need to do to prove that is explore these classic white envelopes! Our variety is basically endless too! You might be saying to yourself how can a white envelope be different from another? Well we have sixteen variations! From pinstripe to laid, from linen to translucent, from non foil lining to foil lining, we have it all! Any and all choices will keep your content sophisticated and classy - the best combination for showing off your style. White 51/2 x 8 1/8 Envelopes are a versatile mailer which can be used for greeting cards, invitations, letters, brochures and more. These postage receptacles feature a rectangular gummed flap which can be trusted to keep the contents safe and secure. White A8 Envelopes measure in at 5 1/2 x 8 1/8 and are available in 16 different varieties of white. They are sold in increments of 25, but once you hit 1000 you'll be saving money!